When going through some of Josh’s school work last night, I came across a heart tugging assignment that he did. 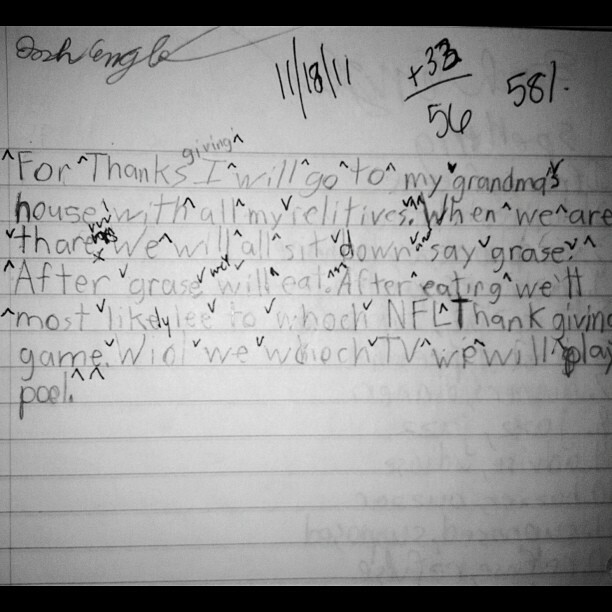 Three days before Joshua died he wrote about his plans for Thanksgiving with the family. I wanted to share it with everyone. Remember that life is short, and we need to live everyday to the fullest. Joshua didn’t get the best grade on this writing assignment, but it has touched our hearts! Remember to be awareness advocates! ← Memorial Day (week) Events! I don’t know what happpened to your beautiful son yet my heart goes out to you. I lost my 32 year-old 12/17/2011 a week before Christmas, she was murdered in Charlotte, N.C.. That was only 8 months ago. I know how unbearable this grief is and I will keep you in my thoughts and prayers. I keep focusong more and more on where she is right now…with our God, our creator, our Lord Jesus Christ! I saw her there as she spoke to me one night! She said” Mom! Look who I’m with! Don’t be Cheesy Mom!” You see she used to tell me that whenever I got tooo emotional about something! It was a week or so after the tragedy I was abandoned to my grief, the light was on and my weyes were open and there she was attached, it seemed, to the right shoulder of Jesus! Everything was perfection, peaceful, and bight and golden! We all hope to be there one day. Hold on to the promises of God! ottpatplay@yahoo.com if you want to share with me, god bless you so much.